Apple is launching a search engine called “Spotlight,” at a pace of 3% a quarter — if you have an iPhone or Mac you’ve been using it for a while! Google has gone from unstoppable to “about to be stopped,” in the minds of the smartest folks in the industry. Search ads are Google’s cash cow; unfortunately, for them, it seems that Google is not advancing the platform (outside of slamming massive amounts of “paid inclusion”). “Paid Inclusion” is basically the ads that consumers think are content, but are really ads. You can see this on your desktop by doing a search for “used iPhone.” The majority of the screen real estate is now ads! In the example above 11 of the 12 links are advertisements! On top of that, < 1% of the screen real estate is dedicated to telling this insane fact to consumers! See the tiny ‘AD’ and ‘SPONSORED’ logos? Yeah, barely noticeable … by design. 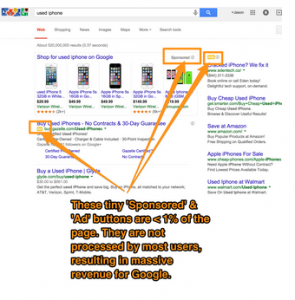 In the old days Google used to highlight the ads with a background color … over time they have included smaller and smaller notes; this is, of course, a huge debate in the industry. In fact, people have done studies to prove that a large percentage of users don’t know they are clicking on ads. Spotlight is what happens on your desktop when you hit COMMAND-SPACE or on your phone when you hit “slide down” when on your home screen. 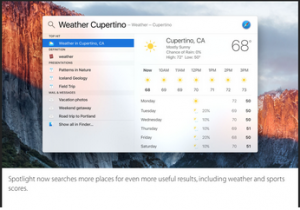 You can see here, when you search for “Weather Cupertino” it gives you the result with no advertisements, no Google logo — nothing but content. On your mobile phone they will show you Wikipedia pages, App Store links and more — without any ads. Every time Apple hosts their World Wide Developer Conference (WWDC) they add a couple of features to Spotlight. The big update came yesterday, with “deep link searching in apps.” Here they show folks searching for “how to make chocolate cake” and subsequently dumping users into the Yummy App. In fact, Apple added the ability to do basic math in the search bar — something Google added back in 2008. So, Tim Cook is playing the slow revenge game, by going into the search business. At this pace, I could see Apple knocking 10 points off Google’s search business here in the USA in the next couple of years by simply making search an advertising-free piece of Apple’s OPERATING SYSTEM! At the WWDC, Apple made a point of saying that they don’t store or use your personal information. This slide is the “f$&k Google” slide, a straight kick in the nuts of Google’s absurd privacy practices, which include searching through our emails and tracking every behavior we make online. Tim Cook is suggesting a better path for users: Apple will give you the ability to search for “free,” as in ad-free and data-collection-free. 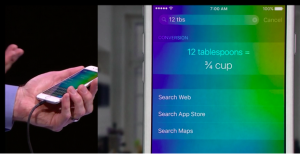 Apple is leapfrogging Google by making search something that is built into the core of your mobile phone and desktop. The reason to do this is that you can compress time by removing the need to visit a website like Google.com. However, don’t be surprised if Apple gives spotlight.com $10m for their domain name and makes a web-based search engine as a final F-U to Google. In fact, the power move for Apple would be to buy DuckDuckGo and use their excellent web search as backfill to the powerful “One Box” search innovations they keep launching every couple of months. Google has encouraged the competition they are getting by grinding consumers with a never-ending advertising assault, not to mention how they have screwed over their partners from Yelp to eHow to YouTubers (and my last company Mahalo — not that I’m bitter! OK, I’m really bitter about it … that happens when you have to lay off 75 people because Google changed their algorithm specifically to screw you and other competitors). Management at Google stopped listening to, and started grinding, consumers and partners shortly after they went public. Executives at Google were always a little odd, but they didn’t used to be marauders. They were nerds who wanted to spread the wealth and build up huge partnerships. However, inside sources tell me the pro-partnership, extroverted executives were driven out and the more introverted, intelligentsia took over. Those introverted innovators used their massive success — built off of founders and users who loved them — and went on a “win it all” campaign. That “win it all” effort is going to wind up delivering a comeuppance for Google’s insular executive team. Right now the government, all their former partners and, recently, a growing consumer contingent, are all rooting for Google to fail. Message to Larry: when you go from loved for giving users unlimited storage with GMAIL and saving YouTube from legal destruction, to being hated by everyone, you’re doing it wrong! Google needs to 10x how they treat their constituents — which is EXACTLY what Tim Cook is doing. Tim Cook is painting Google, accurately, as the evil successor to Microsoft, and Google’s management team is reinforcing this by closing ranks and destroying their partners. Google has a tin ear when it comes to how they are perceived, and if anything will be their downfall, this will be. PS — I’m hosting a Bastille Day/Demo Day Party, complete with a Petanque tournament on July 14th. We’re going to take the afternoon off and play, celebrate and congratulate all these great entrepreneurs who are fighting it out in the arena every day! If you’re an active angel investor or a member of the press, email bastilleday@launch.co. PPS — If you’re an accredited investor and you want to invest in the same startups I’m investing in, you can sign up for my AngelList Syndicate at angel.co/jason/syndicate. PPPS — We are hiring two audio/video/directors here in San Francisco to work on my podcast This Week in Startups. It’s literally the greatest job in the Bay area if your passion is video, podcasting and/or startups. You can apply here!